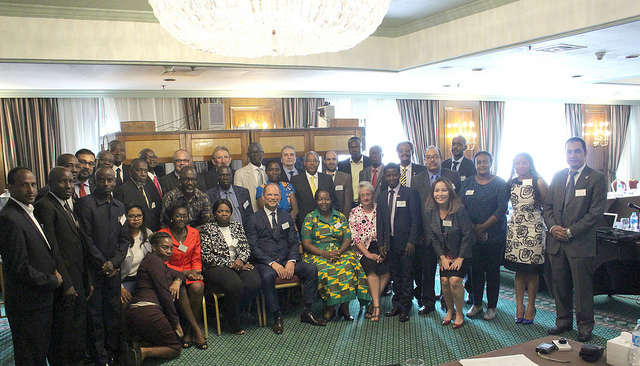 Tania Marshall and Roger Dixon attended a workshop (along with Abdul Kenan and Matamba Tsanwani from the Council of Geoscience) on “Harmonization, Adaptation, Implementation and Development of the United Nations Framework for Classification (UNFC) in line with the African Mining Vision (AMV)” in Cairo, Egypt 2-6 October 2017, to share the experience that the SSC had in the development of the SAMCODES and in the establishment of training protocols. The SAMREC and SAMVAL Codes have all been updated to version 2016.1. Please download these versions to replace your files (all changes are non-material). The SAMESG Guideline has been updated to version 2017.1 (this is a material change from the previous version). A new Table (compatible with SAMREC Table 1) as well as an explanatory briefing document have also been provided. Please visit the SAMESG page for further details and downloads. Updated information and downloads are available respecting individuals who are not registered with a Statutory Body, but who still wish to sign off on Publicly released Competent Persons Reports. See Peer Review of GSSA/SAIMM Members on the RHS of the page. A new Certificate of Excellence is to be awarded for SAMCODES compliance for non-listed companies. Do you want to win a Squirrel? 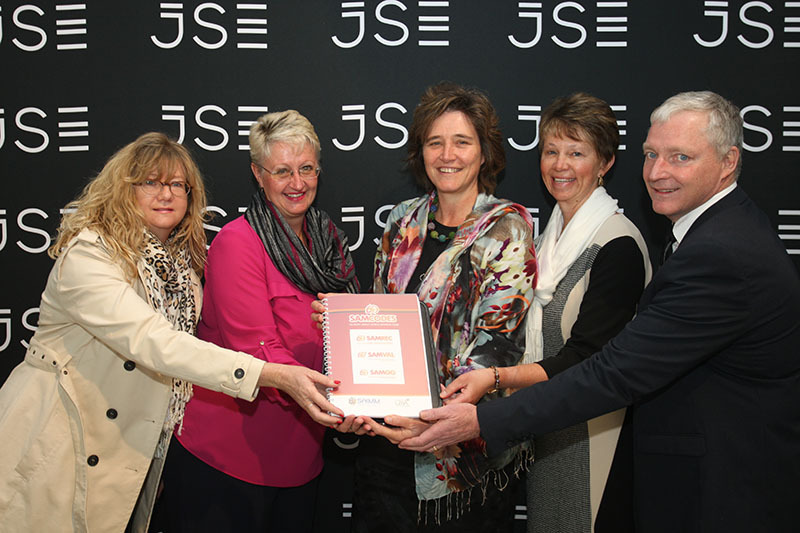 Each year the Investment Analyst Society of South Africa (IASSA), in conjunction with SAMREC, presents a (Squirrel) Award to the JSE listed Company which has produced the Integrated Annual Report most compliant with Section 12.1 (of the JSE Listing Regulations), the SAMREC Code (including Table 1) and the SAMVAL Code. Adjudication of the reports is done by a panel of experts drawn from the mining industry and the JSE Readers Panel. The award is usually in respect of the previous year’s reporting. The Squirrel awarded in 2016 went to AngloGold Ashanti for their 2015 Integrated Annual Report. During 2017, IASSA/SAMREC awarded two Squirrels – one for companies with a market capitalization greater than R15M and one for companies with a market capitalization less than R15M. The winners of these trophies (presented in June 2017) were Impala Platinum Holdings Limited and Keaton Energy Holdings Limited, respectively, for reports submitted during 2016. They were awarded at the Business Day/ IASSA awards function held at the JSE (and presented live on Business Day Television). So, if you want to want to win a Squirrel next year, you don’t have to do anything except compile an exceptional JSE Section 12 and SAMCODE compliant Integrated Annual Report. Our adjudication panel will do the rest. The 2016 version of the SAMCODES were compiled into an A4 document comprising the SAMREC, SAMVAL and SAMOG Codes. 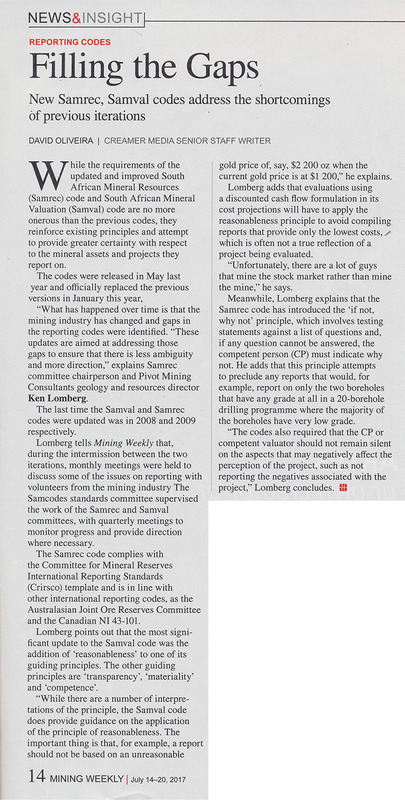 In addition to the three Codes, two Guideline documents were also completed – the SAMESG and the Diamond Guidelines (the latter is simply part of the SAMREC Code, but can also be used as a stand-alone guide to the compilation of diamond-specific Competent Persons Reports). Both documents have both been incorporated into the Companion Volume and also appear on the SAMCODES website. The SAMREC/SAMVAL Companion Volume Conference was well attended, with about 130 people attending. Many were senior members of the industry and there was a good dynamic as a result. Some 61 papers were submitted and only 32 were published. The general consensus from the delegates was that the papers and conference was of very high quality. The Conference Committee and the SSC would like to acknowledge the SAIMM conference team – particularly Sam Moolla, Raymond van der Berg, Camielah Jardine and Nazli Mamdoo for their assistance in organising the conference and the Companion Volume publication. 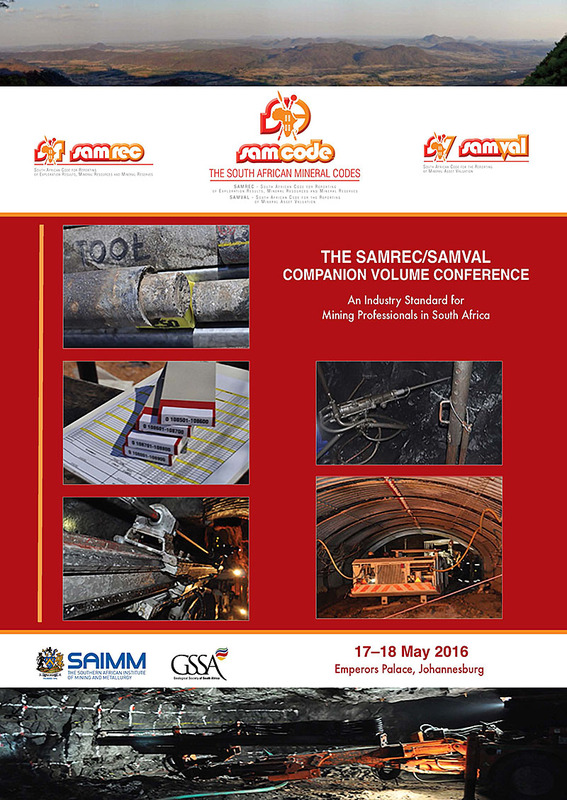 The 2016 SAMODES were launched at the SAMREC/SAMVAL Companion Volume Conference and Launch Breakfast at the JSE during May 2016.